Western Power are doing something to our electrical supply, in which cause, they turned the electricity off at 8:30 on the dot this morning. 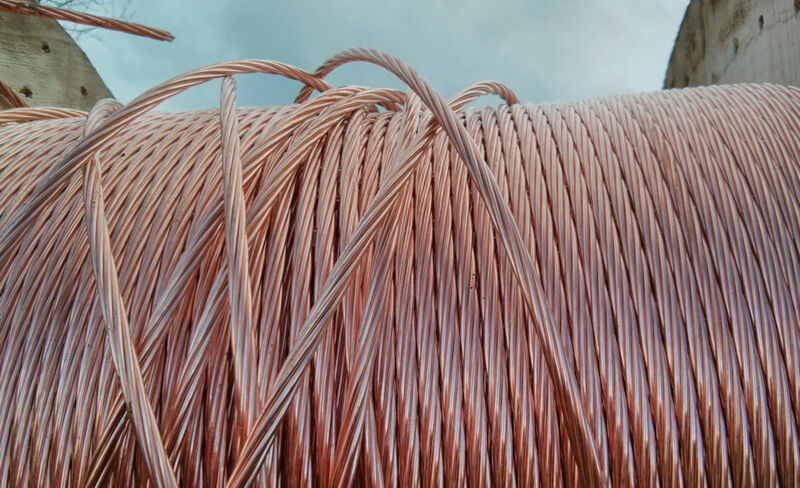 All over the village, there were men in hi-vis shinning industriously up and down poles, diggers, vans, and there was even a trailer filled with vast reels of delightfully sparkly copper wire. The electricity did not come back on again till well after 6pm. I had just despaired that it would ever return, and boiled my camping kettle on the camp stove to make coffee. At the very moment that the whistle on the kettle blew, the electricity returned at last. They are supposed to be doing it all again tomorrow, so I may try making Emergency Camping Stove Coffee earlier tomorrow. Just in case it works. Oh this wire is awesome. I just want to touch it! It is very decorative. And having come to the end of a second day without electricity, I now *really* appreciate its useful qualities! Copper is a truly beautiful metal. I once visited the El Salvador copper mine in Chile (now closed), and saw the huge vats that they used to refine the copper (I think by means of an electrochemical reaction, to lay it down in sheets on a substrate), and then the sheets and sheets of gleaming copper stacked up and tied like parcels. And because pure copper is soft, the sheets had creased around the ties just as if they were cloth. It's a really beautiful metal, more so, i think, than gold, but I suppose gold does not tarnish, which sets it apart.